The most valuable silk carpet in the world is in the Mevlana Museum in Konya, Turkey. Marco Polo’s journeys in the thirteenth centuries took him here, and he remarked that the “best and handsomest of rugs” were to be found in Turkey. Fez Travel offers day tours in a wide range of locations around Turkey. They are a great way to see a lot of things in a short time, and you will visit each site with one of our expert local tour guides, all of who have studied history and archaeology at university. Istanbul is one of the most amazing cities in the world!! Whether it’s picking up a bargain at the Grand Bazaar, being awestruck by the beauty of the Blue Mosque and St. Sofia or stocking up on spices at the Egyptian Spice Market, the only city that spans two continents, is bound to leave an impression on even the most seasoned traveller. Istanbul by night, is illuminated by spotlit mosques, coloured lights on the bridge, busy street traffic and the ambient glow from the cafes, bars and restaurants. There is just as much to discover by way of culinary delights or entertainment such as a Turkish folklore evening. One of our many day or evening tours will show you the best that Istanbul has to offer and leave you with a wish that you could stay for a little longer. With a geologically unique and beautiful landscape, formed as a result of the erosion of hardened volcanic ash deposited following the eruption of Mount Erciyes many millennia ago, Cappadocia is often described as the jewel in Turkey’s crown. Rather than referring to just one town, Cappadocia is the name given to the area which comprises several charming villages, numerous wineries, former Greek settlements, pottery workshops and a range of valleys which are a hiker’s delight. The ‘land of the wild horses’ is eerie and beautiful in equal parts and, as you wander around its lunar-like landscape or sail peacefully above it in a hot air balloon, you can’t fail to be impressed. We offer tours of North Cappadocia, South Cappadocia and the Ihlara Valley. At night, we recommend you go to a Turkish Folklore Evening where you will see a showcase of Turkish folk dancing. 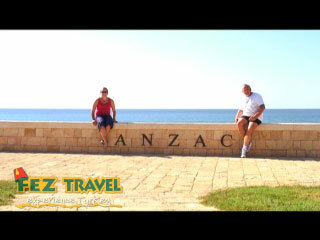 Pay your respects at Gallipoli by joining a Gallipoli Day Tour. You’ll be taken to the Gallipoli Peninsula where you can cast your mind back to 1915 and learn about the history of those brave soldiers who lost their lives in ferocious combat. Visit the ancient city of Troy, famous for the legendary Trojan horse from the times of Beautiful Helen, Queen of Sparta and Paris, the Trojan Prince on our Troy Day Tour. Kusadasi and Izmir are the gateways to all things Ancient! Take one of our daily Ephesus Tours and visit Ephesus with its well preserved, colonnaded Arcadian Way, Hadrian’s Temple, spectacular Theatre and the amazing Celsus Library. You can also visit St John’s Basilica, the site of the Temple of Artemis and the Virgin Mary’s house where many believe is where she spent the final years of her life on earth. Once you have soaked up some history, there are plenty of other things to do such as visit the Aquapark or go on a Jeep Safari. Pamukkale – famous for its white travertine pools filled with healing thermal water. On our Pamukkale Tour you will visit the ancient Roman spa town of Hierapolis, with its magnificently preserved Necropolis, main street, gates, thermal baths, Greco Roman Theatre and the Basilica of St Philip. If you have a second day available in the area, visit Laodicea and Aphrodisias, a former school of marble sculpture and home to the Temple of Aphrodite. Any of these day trips offer the perfect balance for those running short on time but wish to explore the sites in comfort. The Thrace Wine Tour offers a new alternative to the traveller who wishes to take the road less travelled. Close to Istanbul, an opportunity to visit the wine producers, experience the terroir, discover new tastes, and experience the natural local village life. Starting with the 'bud break' of the vines in April until the end of harvest in October. We invite everyone to come and discover its culinary experiences, meet its cultural and historical heritage, the scenic roads and the wonderful life in the vineyards. We depart at 8:00 a.m. from your hotel. Our first stop is Chamlija Vineyards in Kirklareli with a short visit to small pretty village Poyrali. Afterwards we will drive to a height of 850 meters to the peak of the Strandja Mountains, with its spectacular views, to have our first tastings of Chamlija Wines. The Grape types are Reisling, Viogner, Papazkarasi, Alvarinho, Pinot Noir, Petit Verdot, Cabernet Franc, Narince, Cabernet Sauvignon and Merlot. We then head to Vino Dessera Vineyards and its small boutique winery and cellar. It is located between Luleburgaz and Strandja mountains, where once the Ancient Wine Route passed. The varieties planted here include Sauvignon Gris, an old and low yielding clone of Sauvignon Blanc with deliciously creamy, fresh character. After having lunch at Vino Dessera, we drive to our second region, Tekirdag and visit Chateau Nuzun Vineyards and Winery, the geographic heir to the ancient Thracians who practiced farming and viticulture in the area. They keep the tradition alive with its chateau-style boutique wine production. The Nuzun family grows Cabernet Sauvignon, Merlot, Pinot Noir, Syrah, Zinfandel and Öküzgözü type vines. They present the coupage and the monosepage products after they nest in French oak barrels and finally in bottles. At the end of this informative, tasty, cultural and natural day we return you back to your hotel at around 7 p.m.
' tour. This means it will depart regardless of how many people are booked on to it. One of the most beautiful sights in the world, the Bosphorus, is the strait separating two continents - Europe and Asia. 1. Beylerbeyi Palace is closed on Monday and Thursday and replaced with Imperial Yildiz Park and Yildiz Porcelain Factory. Depart early morning for afternoon tour of Troy. 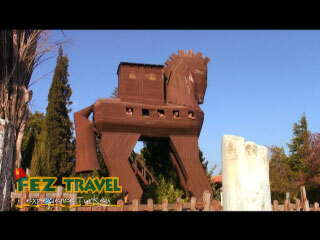 After lunch in Eceabat, we take a ferry across the Dardanelles and drive to Troy which is famous with the legendary Trojan Horse from the times of Beautiful Helen, the Queen of Sparta, and Paris, the Trojan Prince. After the tour, we return back to ferry port to take a ferry across the Dardanelles. Return to Istanbul after the tour. Duration: 19.30 pm to 23.30 pm. A short drive to the boat to cruise up the Bosphorus. The waterway lies between Europe and Asia and passes under the suspension bridges whilst viewing Ottoman summer palaces, waterside mansions and modern villas lining the European and Asian shores. The panoramic view of Istanbul from the Bosphorus at night with dinner, traditional folk dancing and belly dancing will be memorable. 1. Pick up is between 08:00 and 09:00 depending on where there hotel is located. Don't miss the opportunity to see whirling dervishes perform the Mevlevi Sema Ceremony at Istanbul's Hodjapasha cultural dance theatre. The ceremony features a complex musical repertoire called 'ayin' and the whirling dance performed by the dervishes represents the mythical journey of man's spiritual ascent through mind and love to perfection. It is a tradition more than 800 years old, and in 2005 it was proclaimed as a Masterpiece of the Oral and Intangible Heritage of Humanity by UNESCO. The ceremony starts after a 15 minute classical instrumental performance by a traditional Turkish orchestra and lasts for around 45 minutes. It is accompanied by 360 degree video special effects projected on the walls of the beautiful historic building and some amazing lighting, adding to the atmosphere of this captivating ceremony. The total duration is one hour, and seats are numbered, so be sure to book early. 1. The pick up time from the hotel is 17:45 - 18:15. The show starts at 19:00. Deep cleanse your body and mind during a 2 hour traditional Turkish bath experience at Istanbul's Cagaoglu Hamami, a gorgeous 18th-century bath house. As authentic as cultural experiences get, a Turkish bath experience remains much the same now as it was during the Ottoman era. Relax on a marble slab in a steamy bath chamber, have a vigorous and exfoliating scrub to strip away dead skin cells, and then relax in a cooler room. Hotel pickup from hotels on European side of Istanbul are also included. 1. The pick up time is any time between 10:00 - 20:00. The last entrance to the bath is at 21:00. Pick up from your hotel in Istanbul and take an early morning flight to Kayseri. On arrival, transfer to the village of Urgup to start your tour. Our first stop is Esentepe, followed by a visit to Uchisar Castle. We then visit Goreme Open Air Museum and Ortahisar Castle. Afterwards we visit the fairy chimneys of Pasabag follwed by Devrent Valley. Transfer to the airport for your return flight to Istanbul. On arrival, transfer to your Istanbul hotel. Explore the beauties of Bosphorus shores with this short trip. This tour includes a Bosphorus Cruise and visits the Spice Bazaar, Rustempasa Mosque and concludes with the arrival to pier in Eminonu. 2. Pick up is only from hotels located in the Sultanahmet (the old city) or Taksim area. Explore the beauties of old town with this short trip. This tour includes a visits the St Sophia Museum, Byzantine Hippodrome, Blue Mosque and concludes in Sultanahmet. Depart from your hotel in Kusadasi in the morning. After a 2 hour drive your tour starts with the visit tp Priene which was one of the most active ports of the Ionian Federation. The city is the oldest example of geometric city planning. Thereafter visit Miletus which has provided its alphabet to the rest of the classical world, was a great port and the hometown of several philosophers and sages. Continue to Didyma's Temple of Apollo with its very well-known oracles was one of the most sacred places of antiquity. Although looted and burnt many times it remains impressive. At the end of the tour you will be transferred to your hotel. Depart from your hotel in Kusadasi, Selcuk or Izmir in the morning and drive to Laodicea which was the chief city of the Lycus River Valley region. The full name of the city was Laodicea ad Lyceum (Laodicea on the Lycus). The city was originally known as Diospolis ("the City of Zeus"). The Greek deity considered to be the greatest of the Olympian gods. After the visit to Laodicea we will depart to Aphrodisias the ancient city dedicated to Aphrodite, the goddess of Beauty, Love and Fertility, also famous for its school of sculpture, we visit the stadium, which is the best preserved in Anatolia, the Temple of Aphrodite, the Tetrapylon, theatre, the Museum. A Kusadasi Jeep Safari promises to be a day of fun and adventure in surroundings you could not access any other way. Only half an hour from Kusadasi you will find yourself in pine scented forests, see unspoilt tiny villages and remote coves. We travel in a convoy of 4x4 jeeps affording you the best of vantage points. Our route takes us on 60km of on road and 40km of off road terrain and includes the National Park. We make scheduled stops to Zeus Cave, Echo Valley, a monastery and a waterfall. You have a substantial lunch at a 800 metre peak in amazing scenery, and later have an opportunity to wash off the days dust in the sea at Long Beach. 1. Pick up is between 9 am and 10 am and drop off is between 5 pm - 6 pm depending on where your hotel is located. 2. Please advise us of your pick up location upon booking, or at the latest 48 hours before-hand, so that we can confirm your pick up time. Visit Derinkuyu Underground city, which is 85 m deep and Ihlara Valley along the Melendiz river. Selime Monastery and Yaprakhisar panaroma. A great night out where dinner, unlimited beer, wine, Turkish Raki, soft drinks and entertainment is included in the price. The show features belly dancers, traditional folk dancers and traditional musicians. Visit Perge a famous antique site. After Perge drive to Aspendos which has the best preserved 2nd Century Amphitheatre. Later we visit Kursunlu Waterfalls . 1. Pick up is between 07:00 and 08:00 depending on where there hotel is located. 3. Please contact Fez Travel on feztravel@feztravel.com if you wish to do this tour on a private basis. Visit the best examples of Lycian tombs at Myra and the Church of St. Nicholas the saint to whom is referred to as Santa Claus. After lunch, sail over turquoise waters to the picturesque Kekova Island. Discover the extraordinary underwater ruins of the sunken city of Simena and visit the noteworthy Lycian necropolis at Teimiussa. Visit one of the oldest of the 72 Lycean settlements, built in the unspoilt Turkish countryside. Rock tombs, Agora, Roman baths and theatre with superb photo oportunities. The next stop will be the dramatic Hidden Gorge. This gorge has been formed throughout the centuries by melting snow. You are able to wade through the almost zero degree waters of the canyon. Enjoy the romantic bays of the Mediterranean, Fethiye Gulf, where you can swim in the crystal blue water. Throughout the day you will stop in many places for around 45 minutes- 1 hour including Dockyard Island, Flat Island, Red Island and Aquarium bay. Its suggested to look around carefully during the tour because you might have the chance to see the dolphins, and even the sea turtles! All you need to enjoy this wonderful trip and all its beauty is your beach bag, we will do the rest.